Twonest wrote: "Sparrowheart, Sparrowheart, Sparrowheart!" cheered Twonest for the clan's newest warrior. Dreamswim wrote: Dreamswim purred and licked at the five tiny kits at her side as they mewled and squealed for milk. As she touched her nose to each kit, she sent a silent thanks to StarClan for a healthy litter. Dodgeshade wrote: Dodgeshade padded out of his den, carrying a stick in his jaws with a moss ball at the end. Wrinkling his nose in disgust, he made his way into the elder's den. Stormshrew wrote: Stormshrew padded past her clanmates and into the nursery, squeezing inside carefully. Once inside, she dipped her head to the other queens and settled down into an empty nest. Soulmountain wrote: Soulmountain padded into the ShadowClan camp, carrying a mouse in her jaws. She made her way into the elder's den, dropping the mouse at the elder's paws with a dip of her head. Shadowstar wrote: "Let all cats old enough to catch their own prey gather for a clan meeting!" yowled Shadowstar from the center of the clan camp. Bramblekit pricked up her ears and padded out of the nursery to hear what Shadowstar had to say. "We gather today to welcome six kits into their lives as apprentices." continued Shadowstar once the clan had gathered. "Flickerkit, you will be known as Flickerpaw. Mallowsong, you will be mentor to Flickerpaw. Freezekit, you will be known as Freezepaw. Sparrowheart, you will be mentor to Freezepaw. Littlekit, you will be known as Littlepaw. Shortberry, you will be mentor to Littlepaw. Elkkit, you will be known as Elkpaw. Shadowheart, you will be mentor to Elkpaw. Jaykit, you will be known as Jaypaw. Songthistle, you will be mentor to Jaypaw. Warblerkit, you will be known as Warblerpaw. 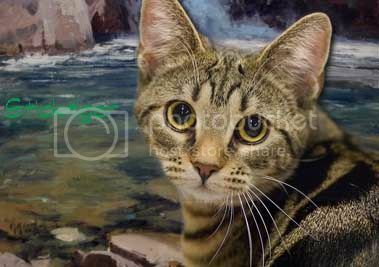 Jayriver, you will be mentor to Warblerpaw." Flickerpaw puffed out her chest and padded over to Mallowsong. Freezepaw let out a loud yowl of happiness and bounced over to Sparrowheart. Elkpaw wiggled happily and padded over to Shadowheart. Jaypaw closed her eyes for a moment, trying to ignore how many cats were around her, then gave herself a shake and padded over to Songthistle. Littlepaw quietly padded over to Shortberry. Letting out a purr, Warblerpaw padded over to Jayriver. "Ready to go explore the territory?" meowed Jayriver as she touched noses with Warblerpaw. "Let's go work on hunting." meowed Mallowsong as he touched noses with Flickerpaw. "Ready to learn how to fight?" meowed Sparrowheart as she touched noses with Freezepaw. "Mind if we come with you?" meowed Shortberry to Jayriver. "I hope you don't mind if we tag along." meowed Shadowheart to Mallowsong. "Go get to know your new denmate." meowed Songthistle as she touched noses with Jaypaw. "Flickerpaw, Freezepaw, Littlepaw, Elkpaw, Jaypaw, Warblerpaw!" 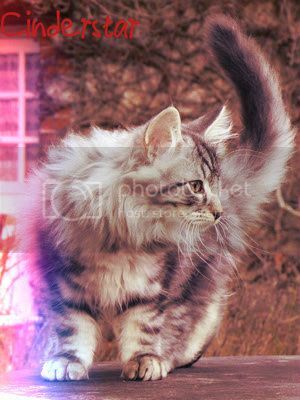 cheered Specklekit for his former denmates. Stormshrew purred and licked at the four tiny kits at her side as they mewled and squealed for milk. As she touched her nose to each kit, she sent a silent thanks to StarClan for a healthy litter. Brightheart padded into the ShadowClan camp, carrying a rabbit in his jaws. He made his way into the elder's den, dropping the rabbit at the elder's paws with a dip of his head. Dodgeshade padded out of his den, carrying the body of Shadowstar in his jaws. He made his way to the center of the clan camp, placing his father down so the clan could grieve. Flickerpaw padded forward and pressed her nose into Shadowstar's fur. Copperdawn padded over and pressed his nose into Shadowstar's fur. "It's time." meowed Dodgeshade to Copperdawn. Copperstar raced back into the ShadowClan camp with Dodgeshade, and tossed his head back in a yowl as his paws touched the center of the clan camp. "Cats of ShadowClan. Listen, And I will appoint the new deputy. I say these words before StarClan so our ancestors may hear my approve and choice...Sticktiger will be the deputy of ShadowClan!" "Thank you, Copperstar." meowed Sticktiger with dip of his head. "Copperstar, Sticktiger! 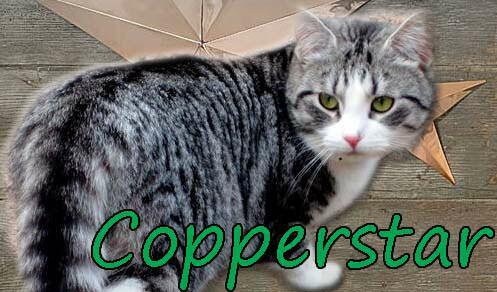 Copperstar, Sticktiger!" cheered Wolfboulder for the clan's new leader and deputy.